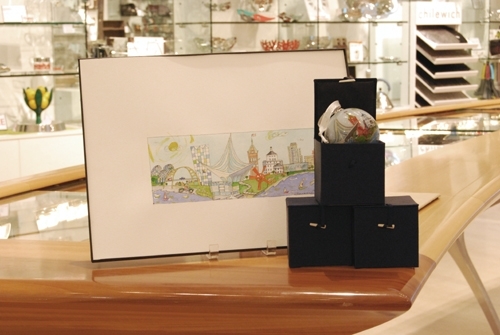 Chrisanne Robertson's illustration in the Museum Store. Photo by the author. This winter, the Art Museum Store has had the good fortune to forge a new and wonderful relationship with an exciting Milwaukee artist, Chrisanne Robertson. Chrisanne worked closely with our Product Development lead, Julia Jackson (you can read my previous post about Julia’s work for the Museum here) to create a bright and cheerful keepsake ornament featuring Milwaukee’s lakefront. Chrisanne applied her creative vision and talents with a watercolor paint brush and ink to a delightful design, which Julia then had reproduced onto a glass ornament. 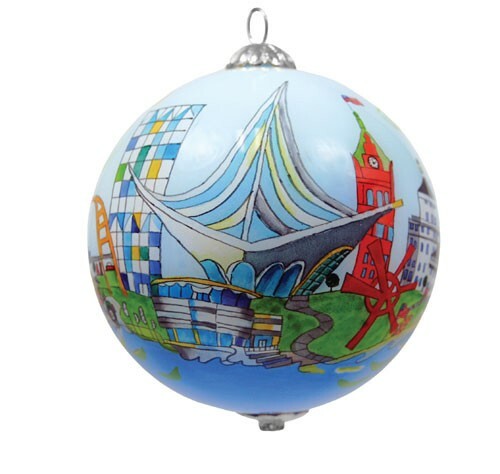 The inside of the spherical ornaments are painstakingly painted by hand with a teeny-tiny brush inserted through the teeny-tiny hole at the top of the ornament. Ornament by Chrisanne Robertson. Photo by Museum Store. Chrisanne Robertson at the Museum Store. Photo by Third Coast Digest. The “Grand Unveiling” of Chrisanne’s new holiday ornament took place at the Museum Store’s annual Milwaukee Art Museum Member Private Holiday Shopping Event. Biking through the winter weather from her home-base and studio in Milwaukee’s Riverwest neighborhood, Chrisanne joined us for the evening wearing a festive pink sparkling beret that perfectly announced both her vivacious personality and the advent of the holiday season (in my mind, nothing says “parTAY” like sequins). Chrisanne so thoroughly charmed the Museum Store staff with her liveliness and warm hugs that we welcomed her back into the store not once, but two more times before the holidays came to a close. 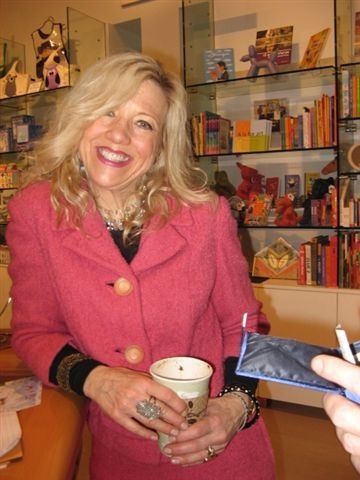 Each time, a small crowd would gather, engaged by Chrisanne’s charisma and the sunny little glass globes she wielded. On her last visit, she even drew some press, resulting in this sweet article by Judith Ann Moriarty at Third Coast Digest. This entry was posted in Art, Behind the Scenes, Museum Buildings and tagged Chrisanne Robertson, Christmas, Holidays, Museum Store, ornaments. Bookmark the permalink.